You have a 14 days window to complete the course once you are registered. Each Course takes approximately 1 hour to complete. This is not a “live” course so you can take the course anytime within the 14 day window assigned at the time of purchase. All online courses result in a Completion Certificate and an Open Badge which is issued upon passing a quiz. Technical Requirements- Please use Chrome or Safari. Firefox and Internet Explorer are not supported. Chrome should be up-to-date. This course is designed to meet state bullying prevention training requirements for school staffs. The course will: 1. define bullying as prescribed by law, 2. give an overview of state legislative requirements, 3. provide teacher and staff training on responding to bullying and 4. will give guidance to the district, school and staff responsibilities as defined by legislation. More……..
School Staff ORDER NOW! Individual – ORDER NOW! 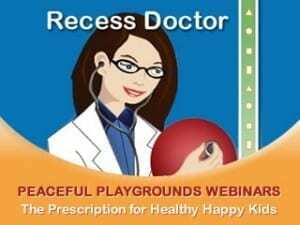 The Peaceful Playgrounds Online Playground Supervisor Training is designed to introduce administrators, teachers, substitute teachers, physical educators, parents, after-school personnel, and playground supervisors to the responsibilities and techniques associated with keeping children safe on a playground. This course details playground surfacing, play structure safety, and playground supervision. The course highlights legal supervision responsibilities and “how to keep kids safe”. More……..
School Staff – ORDER NOW! Individual- ORDER NOW! A Peaceful Playground? Sound Impossible? It’s not. 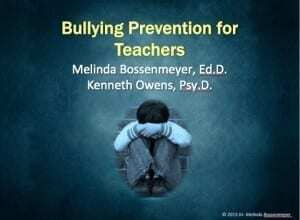 With a few proven strategies, we’ll show you how to reduce bullying, and reduce playground conflicts, resulting in happy students and a thankful staff. 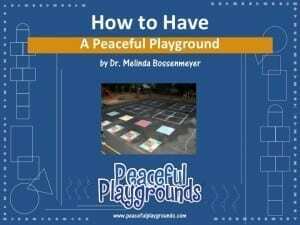 Peaceful Playgrounds Training ORDER NOW! A few brave principals across the nation are bringing a long-standing school tradition to an end. They are advocating Recess Before Lunch. 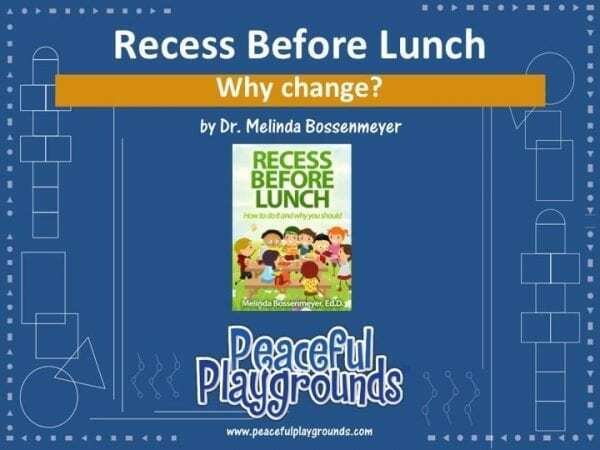 Recent research shows the number of schools implementing Recess before Lunch is rapidly growing. Kids eat more, waste less food, return to the class calmer, behave better and as a result, instruction time is increased. Sounds great but implementing Recess Before Lunch can be tricky. We share 5 steps to prepare staff, students, and parents for successful implementation. Recess Before Lunch Training ORDER NOW! Have you considered using pedometers with children? This webinar will provide some basics strategies for building a motivating walking program with children. We Count is a research-based walking program which includes information, parent and student newsletters, mini lessons, motivational materials and more for getting kids moving. This free webinar teaches participants how to make those steps count toward better health. 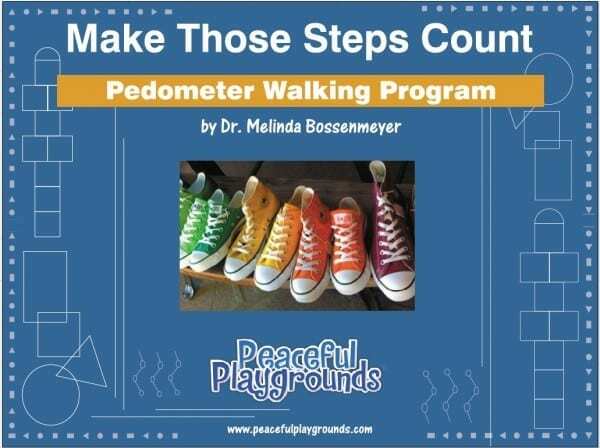 Pedometer Walking Program Training ORDER NOW! Topics Covered: 1. The do’s and don’ts of grant writing, 2. Critical elements necessary for getting your grant funded, 3. 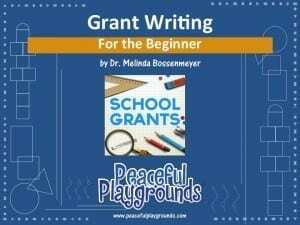 Strategies and support provided by Peaceful Playgrounds in your grant writing efforts and 4. The success formula for writing your grant. Don’t miss this opportunity to hear practical advice from an experienced and successful grant writer. Dr. Bossenmeyer’s grant writing has secured more than $10 Million in funded educational grants. Grant Writing 101 Training ORDER NOW! Playgrounds don’t have to be expensive to get kids active. In fact, upper elementary students rarely play on play structures at all. 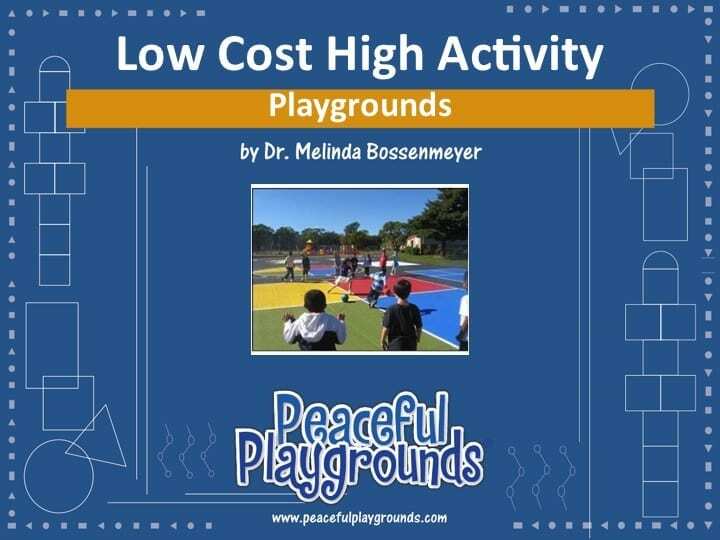 This session will cover alternatives to the typical playground structure and the research behind the effectiveness of alternative playgrounds strategies like portable equipment, loose equipment, painted playground markings, and natural playgrounds. Low Cost, High Activity Playground Training ORDER NOW!